3D printing has become even more affordable this year. If you are on a budget, Anet A8 3D printer going for under $150 is often recommended on the web, but if you have a bigger budget, you’d get printer with a metal extrusion frame, larger build volume, and overall better quality, and Creality CR-10 3D printer is often recommended by reviewers for people with a $300-$400 budget. All those printers print with a single color, which depends on the color of the filament used. The cheapest way to get a colored sample is to paint it yourself after printing. There are printers with dual extruder allowing to use two filament rolls with different colors, but when Karl reviewed Tevo Tarantula 3D printer with dual extruder, he found it was hard to print, was unconvinced with the results, and found it to be an unnecessary upgrade, preferring painting instead. At the other range, you have professional full color 3D printers from companies like Statasys, but you’d have to ask for a quote to get a price, and according to Cati.com, models like Stratasys J750 full color 3D printer cost over $200,000. 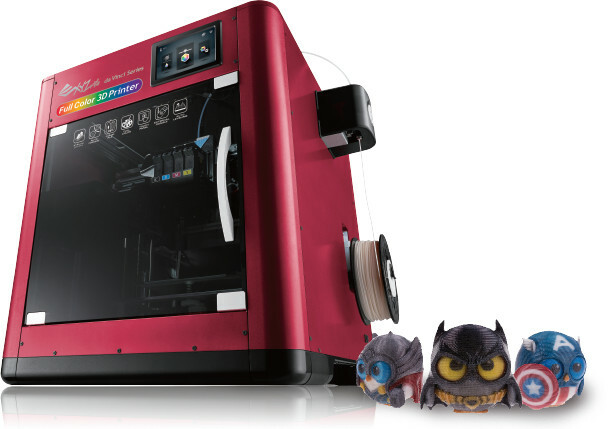 Mcor ARKe brings the price down to $6,000, but the cheapest full color 3D printer appears to be XYZPrinting da Vinci Color 3D printer currently up for pre-order for $2,999 until October 31th, which should make it affordable to at least some individuals. The company provide XYZmaker free 3D software for the printer, working with Windows 7/8/10, Mac OS X 10.10 and greater, or Ubuntu 14.04 or greater. It can handle AMF, PLY, OBJ, STL, and 3CP file types. The video below clearly explain how it works with one filament, and four CYMK ink cartridges, similar to what you’d use in a standard color printer. You may find more details on the product page. After October 31th, the price will be $3,499. Shipping is scheduled for the end of November.